There are six ways to subset atomic vectors. There are three subsetting operators, [[, [, and $. Subsetting operators interact differently with different vector types (e.g., atomic vectors, lists, factors, matrices, and data frames). Subsetting can be combined with assignment. Subsetting is a natural complement to str(). While str() shows you all the pieces of any object (its structure), subsetting allows you to pull out the pieces that you’re interested in. For large, complex objects, I highly recommend using the interactive RStudio Viewer, which you can activate with View(my_object). Take this short quiz to determine if you need to read this chapter. If the answers quickly come to mind, you can comfortably skip this chapter. Check your answers in Section 4.6. If x is a matrix, what does x <- 0 do? How is it different from x <- 0? Section 4.2 starts by teaching you about [. You’ll learn the six ways to subset atomic vectors. You’ll then learn how those six ways act when used to subset lists, matrices, and data frames. Section 4.3 expands your knowledge of subsetting operators to include [[ and $ and focuses on the important principles of simplifying versus preserving. In Section 4.4 you’ll learn the art of subassignment, which combines subsetting and assignment to modify parts of an object. Section 4.5 leads you through eight important, but not obvious, applications of subsetting to solve problems that you often encounter in data analysis. Use [ to select any number of elements from a vector. To illustrate, I’ll apply [ to 1D atomic vectors, and then show how this generalises to more complex objects and more dimensions. Note that the number after the decimal point represents the original position in the vector. In x[y], what happens if x and y are different lengths? The behaviour is controlled by the recycling rules where the shorter of the two is recycled to the length of the longer. This is convenient and easy to understand when one of x and y is length one, but I recommend avoiding recycling for other lengths because the rules are inconsistently applied throughout base R.
Nothing returns the original vector. This is not useful for 1D vectors, but, as you’ll see shortly, is very useful for matrices, data frames, and arrays. It can also be useful in conjunction with assignment. If the vector is named, you can also use character vectors to return elements with matching names. Subsetting a list works in the same way as subsetting an atomic vector. Using [ always returns a list; [[ and $, as described in Section 4.3, lets you pull out elements of a list. The most common way of subsetting matrices (2D) and arrays (>2D) is a simple generalisation of 1D subsetting: supply a 1D index for each dimension, separated by a comma. Blank subsetting is now useful because it lets you keep all rows or all columns. #> [1,] "1,1" "1,2" "1,3" "1,4" "1,5"
#> [2,] "2,1" "2,2" "2,3" "2,4" "2,5"
#> [3,] "3,1" "3,2" "3,3" "3,4" "3,5"
#> [4,] "4,1" "4,2" "4,3" "4,4" "4,5"
#> [5,] "5,1" "5,2" "5,3" "5,4" "5,5"
When subsetting with a single index, they behave like lists and index the columns, so df[1:2] selects the first two columns. When subsetting with two indices, they behave like matrices, so df[1:3, ] selects the first three rows (and all the columns)23. By default, subsetting a matrix or data frame with a single number, a single name, or a logical vector containing a single TRUE, will simplify the returned output, i.e. it will return an object with lower dimensionality. To preserve the original dimensionality, you must use drop = FALSE. The default drop = TRUE behaviour is a common source of bugs in functions: you check your code with a data frame or matrix with multiple columns, and it works. Six months later, you (or someone else) uses it with a single column data frame and it fails with a mystifying error. When writing functions, get in the habit of always using drop = FALSE when subsetting a 2D object. For this reason, tibbles default to drop = FALSE, and [ always returns another tibble. Factor subsetting also has a drop argument, but its meaning is rather different. It controls whether or not levels (rather than dimensions) are preserved, and it defaults to FALSE. If you find you’re using drop = TRUE a lot it’s often a sign that you should be using a character vector instead of a factor. There are two other subsetting operators: [[ and $. [[ is used for extracting single items, while x$y is a useful shorthand for x[["y"]]. 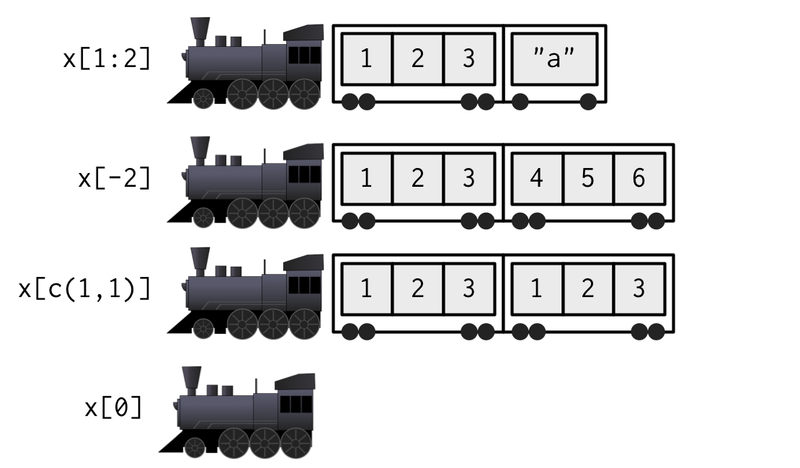 If list x is a train carrying objects, then x[] is the object in car 5; x[4:6] is a train of cars 4-6. Because [[ can return only a single item, you must use it with either a single positive integer or a single string. If you use a vector with [[, it will subset recursively, i.e. x[[c(1, 2)]] is equivalent to x[][]. This is a quirky feature that few know about, so I recommend avoiding it in favour of purrr::pluck(), which you’ll learn about in Section 4.3.3. Doing so reinforces the expectation that you are getting and setting individual values. It’s useful to understand what happens with [[ when you use an “invalid” index. The following table summarise what happens when you subset a logical vector, list, and NULL with a zero-length object (like NULL or logical()), out-of-bounds values (OOB), or a missing value (e.g. NA_integer_) with [[. Each cell shows the result of subsetting the data structure named in the row by the type of index described in the column. I’ve only shown the results for logical vectors, but other atomic vectors behave similarly, returning elements of the same type (NB: int = integer; chr = character). If the vector being indexed is named, then the names of OOB, missing, or NULL components will be <NA>. There are two additional subsetting operators, which are needed for S4 objects: @ (equivalent to $), and slot() (equivalent to [[). @ is more restrictive than $ in that it will return an error if the slot does not exist. These are described in more detail in Chapter 15. Brainstorm as many ways as possible to extract the third value from the cyl variable in the mtcars dataset. I recommend that you should make sure that length(value) is the same as length(x[i]), and that i is unique. This is because, while R will recycle if needed, those rules are complex (particularly if i contains missing or duplicated values) and may cause problems. Subsetting with nothing can be useful with assignment because it preserves the structure of the original object. Compare the following two expressions. In the first, mtcars remains a data frame because you are only changing the contents of mtcars, not mtcars itself. In the second, mtcars becomes a list because you are changing the object it is bound to. The principles described above have a wide variety of useful applications. Some of the most important are described below. While many of the basic principles of subsetting have already been incorporated into functions like subset(), merge(), dplyr::arrange(), a deeper understanding of how those principles have been implemented will be valuable when you run into situations where the functions you need don’t exist. #>   "Male" "Female"       NA "Female" "Female"   "Male"   "Male"
Note that if you don’t want names in the result, use unname() to remove them. #>  "Male"   "Female" NA       "Female" "Female" "Male"   "Male"
Then, let’s say we want to duplicate the info table so that we have a row for each value in grades. An elegant way to do this is by combining match() and integer subsetting (match(needles, haystack) returns the position where each needle is found in the haystack). If you’re matching on multiple columns, you’ll need to first collapse them into a single column (with e.g. interaction()). Typically, however, you’re better off switching to a function designed specifically for joining multiple tables like merge(), or dplyr::left_join(). The arguments of sample() control the number of samples to extract, and also whether sampling is done with or without replacement. To break ties, you can supply additional variables to order(). You can also change the order from ascending to descending by using decreasing = TRUE. By default, any missing values will be put at the end of the vector; however, you can remove them with na.last = NA or put them at the front with na.last = FALSE. You can sort vectors directly with sort(), or similarly dplyr::arrange(), to sort a data frame. Sometimes you get a data frame where identical rows have been collapsed into one and a count column has been added. rep() and integer subsetting make it easy to uncollapse, because we can take advantage of rep()s vectorisation: rep(x, y) repeats x[i] y[i] times. Because logical subsetting allows you to easily combine conditions from multiple columns, it’s probably the most commonly used technique for extracting rows out of a data frame. Let’s create two logical vectors and their integer equivalents, and then explore the relationship between Boolean and set operations. When first learning subsetting, a common mistake is to use x[which(y)] instead of x[y]. Here the which() achieves nothing: it switches from logical to integer subsetting but the result is exactly the same. In more general cases, there are two important differences. When the logical vector contains NA, logical subsetting replaces these values with NA while which() simply drops these values. It’s not uncommon to use which() for this side-effect, but I don’t recommend it: nothing about the name “which” implies the removal of missing values. x[-which(y)] is not equivalent to x[!y]: if y is all FALSE, which(y) will be integer(0) and -integer(0) is still integer(0), so you’ll get no values, instead of all values. In general, avoid switching from logical to integer subsetting unless you want, for example, the first or last TRUE value. [ selects sub-lists: it always returns a list. If you use it with a single positive integer, it returns a list of length one. [[ selects an element within a list. $ is a convenient shorthand: x$y is equivalent to x[["y"]]. If x is a matrix, x <- 0 will replace every element with 0, keeping the same number of rows and columns. In contrast, x <- 0 completely replaces the matrix with the value 0.